This recipe is a combination of two ideas that came from two different places. 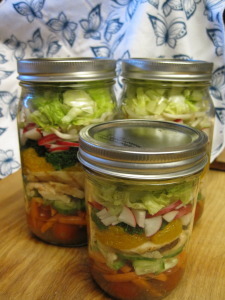 The first is the salad in a jar idea which I discussed a few weeks ago and you can read about here. The second is an idea for a Chinese chicken salad that I ate in the wee hours of the morning in a diner inside the old Boardwalk Hotel and Casino which used to be on the Strip in Las Vegas just north of the Monte Carlo Hotel and Casino. As I was beginning to attempt my first salad in a jar, I noticed that I had a full jar of ginger-sesame dressing. That dressing made me think of the Chinese chicken salad I ate many years ago at the Boardwalk. I thought about the ingredients and decided that if I arranged them correctly, they should make an acceptable combination for creating this salad inside of a quart-sized mason jar. I began by pouring between 1/4 and 1/3 cup of the Asian flavored dressing into the bottom of the jar. Next, I added 7 grape tomatoes on the bottom of the jar. 1/4 cup of julienne carrots were evenly distributed on top of that. 1/2 cup chopped cucumbers were next. I placed the lid on jar and stored the salad upright in the fridge until the next morning when I loaded it upright into my lunch box. At lunch time, when I was ready to serve my salad, I turned it upside down and let the dressing run through it. Then I dumped the whole thing into a large capacity bowl. I packed a small bag containing about 1/2 cup of crunchy chow mein noodles with the salad in a jar and sprinkled them on top. This salad was very good. It held up well for two days in the fridge. I don’t know how well sprouts would hold up over several days, so I made only two of these and we ate them quickly. This makes a very large salad and is good for people with big appetites. If your appetite isn’t so big, I suggest that you make the salad in a pint jar instead. Just cut the ingredients in half, or you can do what I do. I make the salad in a quart jar, and share it with a friend. 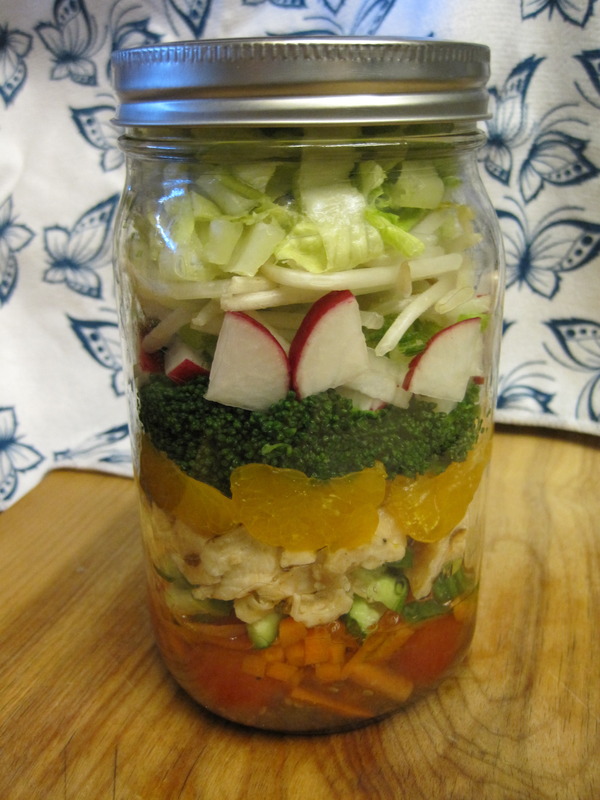 Salad in a jar is a good make ahead lunch and keeps for a few day in the fridge. ¼ to ⅓ cup of the Asian flavored salad dressing. 7 whole grape tomatoes on the bottom of the jar. ¼ cup of julienne carrots were evenly distributed on top of that. ½ cup chopped cucumbers were next. ½ cup of crunchy chow mein noodles. Layer all ingredients, except chow mein noodles, in order listed above into jar. Keep it upright and store in fridge until ready to serve or pack into a lunch box with an ice pack. Pack chow mein noodles in a small baggie to sprinkle on the salad when served. Invert the salad in a jar to distribute the dressing and then pour into a bowl to serve. Sprinkle chow mein noodles on top.